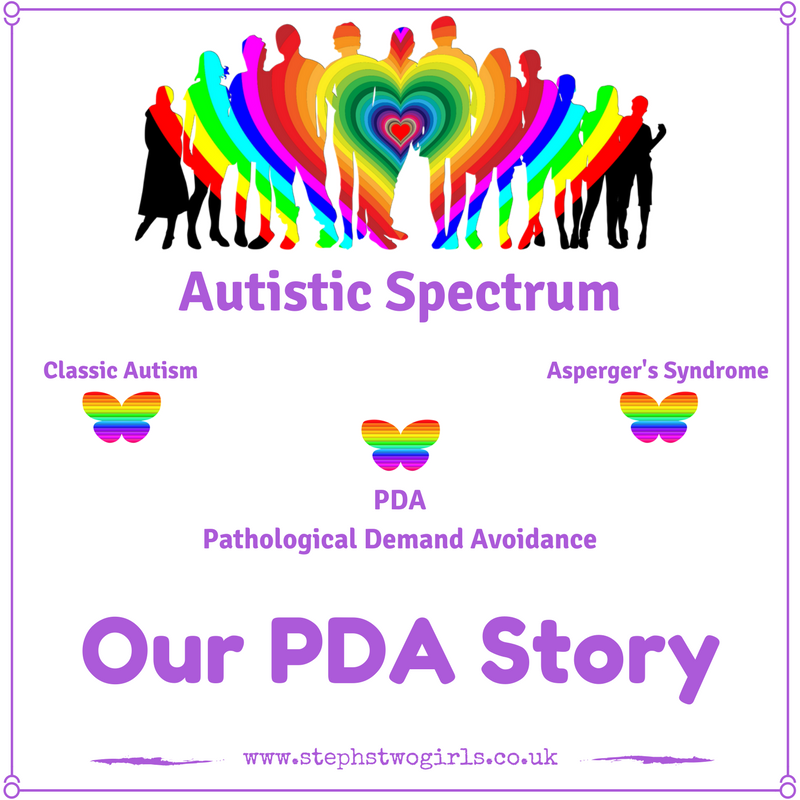 Time for week 24 in my newly relaunched series 'Our PDA Story'. I'm handing my blog over to others who live with the type of autism called Pathological Demand Avoidance, so that they can share with us how life is. This week's contributor writes a very informative blog of her own called Riko's Blog, PDA and more. It provides a great insight into thoughts and feelings of someone living with PDA. You can also find her on Riko's PDA Page on Facebook. Her post Ten things not to say about PDA is one of my favourites. Here, she talks about solutions and how to make life PDA friendly. My name is Riko and I'm a PDAer, I live with my 3 kids (Polar Bear, Monkey and Ton), they are PDA too. We are a PDA Family lol. It's a very different life to most people's, we have very few rules here, everyone is treated equally and everyone is treated with respect. We are all mostly happy and calm. Since finding out about PDA I have changed a lot of the ways I do things at home, this has helped a lot. I was never very good at 'laying down the law' and enforcing rules anyway, not just because they didn't work but because it didn't feel right to me. I never could understand why society is so focused on forcing kids to do things we adults don't do. Our lives are fairly quiet, we sometimes get a lot of appointments all at once and some days loads of events happen at the same time, but we also have lots of down time to rest and recover. I've noticed when we've been out somewhere, like to a museum or play group, that all of us need several hours - several days to recover. Our home educated lifestyle helps provide this. I try to make everything as fair as possible, and I have everyone's needs and preferences to consider, including my own. The kids usually wake whenever they are ready and mornings are a slow process unless we have to be somewhere. Breakfast is whatever everyone chooses and can range from cereal or fruit to ice lollies or nothing. PDAers generally have a varied diet anyway so this fits. The day is spent following our own different interests, with me facilitating as much as possible. The kids learn so much from just doing normal everyday activities and even screens can teach them more than I anticipated. As I found out when we went to a museum to learn about dinosaurs only to find Polar Bear already knew all their names, habitats, feeding habits, etc, from Minecraft. It's important that I model as much as possible because that's the best way PDAers learn and change. It's no good me telling the kids to say 'please' and 'thank you' because that will just become a demand to avoid. But by ensuring I say these things to them as needed I have found they will automatically use them without any demand at all. It's very difficult to juggle parenting, teaching, my kid's needs and my own health needs along with the usual housework, chores and finding time to rest. While things might be far calmer and far easier, it is also extremely exhausting for me. I won't lie, it's not easy, but it is better. I can see what the kids need and tailor things to them, this means far less meltdowns and far less controlling behaviour. They feel (I hope) respected, loved and an equal part of this family. I do still struggle hugely with demand avoidance and have to employ every tactic I have available just to get through each day. I've learnt to put my own needs aside to go running when the kids call, I've learnt to explain why I or they cannot do something in short sentences all with a smile on my face, I've created a sensory heaven in my bedroom for me to retreat to when needed, I've learnt to pick my battles and not push learning some skills on the kids just because society deems them necessary (like eating with a knife and fork, who really cares), I've learnt keeping myself hydrated is essential (no I don't mean wine, though I am developing a taste for it), I've learnt it doesn't matter if the dishes aren't always done, I've learnt that it's fine if the kids eat take out sometimes (okay once or twice a week, but they're trying new foods so that's good). I've learnt how to juggle 3 kids, a pram and a heavy bag onto public transport without having a screaming meltdown. I've learnt how to manage events and outings successfully so that everyone leaves mostly happy and with as few meltdowns as possible (go out rarely, take lots of spending money, don't force the kids to do anything they don't want to do and be prepared to leave after half an hour. Oh and take food). The most important thing I've learnt is that you can lead a happy and (mostly) calm life with PDAers, you just need to throw convention out of the window, stick two fingers up to societal expectations and do what works for you. Thanks for taking the time to read. It would help lots if you can share this post further; in groups, on Facebook or Twitter, any way you choose. Just one more person reading who may not have otherwise seen it will help spread understanding. Please do leave any comments of support below; for more reading about Pathological Demand Avoidance, please see my blog post 'Challenging Behaviour and PDA'. PDA can be mistaken for ODD (Oppositional Defiance Disorder); my most read post explains the difference between PDA and ODD. 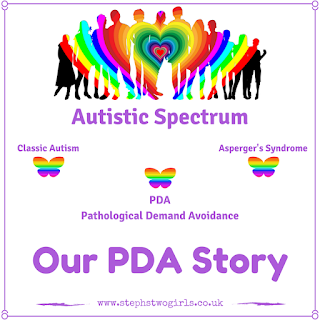 To read previous examples of living with PDA, visit This is our PDA story. This includes experiences from girls, boys, young and old, and includes others from adults diagnosed with PDA. If you feel up to sharing your experiences with my readers to help spread understanding (this can be anonymously), please email stephstwogirls@gmail.com. The PDA Society webpage is full of helpful information, and a great variety of resources can be found on the PDA Resource website. The PDA Society are holding a PDA conference in Birmingham on 18th April 2018. The keynote speakers are definitely worth listening to and there will be plenty of discussion.